Gray New England Day? Homemade Chicken Soup to the Rescue! Let’s just get this out of the way. Mother Nature has NOT been playing nice lately. The truth is that it is the end of January and we haven’t really gotten any cumulative snow….except for that little HALLOWEEN snowstorm! What?! Well, although we don’t have snow, we have had some seriously frigid days, bookended between spring like days. 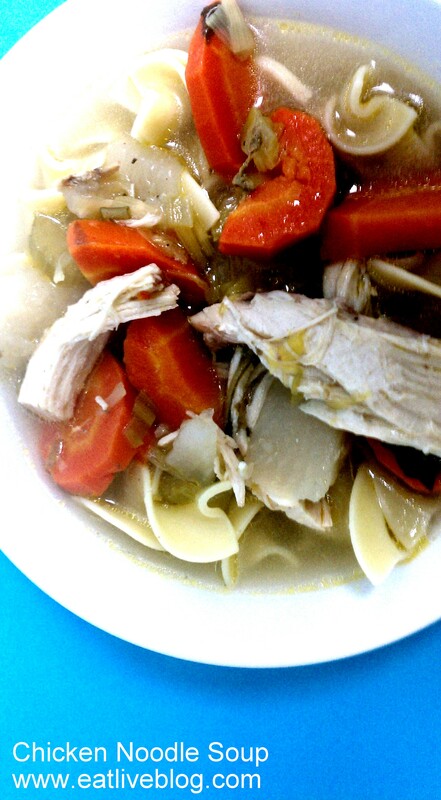 And it is on one of those frigid days that my Chicken Noodle Soup recipe was definitely what the doctor ordered! I have been meaning to blog about this recipe for a while because it is ridiculously easy and delicious. You can absolutely customize it with your favorite veggies and spices. Feel free to experiment. This is a base recipe that I learned by watching my mom throw things together to make the chicken soup. I have been making it since I was about 10 years old, and it has never failed me yet! Serve as is, or a top of your favorite noodles. I am very partial to extra broad egg noodles. Chicken noodle soup would be perfect for a day like today! I agree, perfect for today. There’s nothing like a good bowl of chicken soup. I need to buy some of those extra broad egg noodles! There’s just something about homemade chicken soup that never gets old for me. I love that you put turnips in yours! The turnips TOTALLY make the soup. They are my secret ingredient in beef stew as well!